Analyse users, documents, connections, servers, scheduling, security, which documents use which universes etc. Originally the BusinessObjects repository held all the deployment information for your BOE system. As the repository was a standard relational database the information could be queried via a universe or directly from SQL. Since BusinessObjects XI the repository has been replaced by the “system database”, this maintains its data in binary format and is no longer directly accessible by SQL. 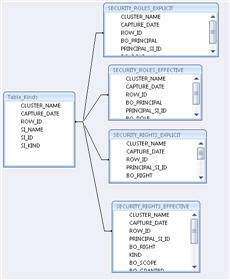 Fortunately, the SAP BusinessObjects software comes with Query Builder, a web based tool for query the system database. Query Builder is ideal for viewing the property/sub property structure of objects and viewing a limited set of data. However, the format of the returned data makes the analysis of larger queries difficult, if not impossible. Query Builder also lacks the ability to export the data returned to a useful format for further analysis. QBXcell is a powerful tool designed to simplify the querying and extraction of data from the BusinessObjects system database to standard relational database, CSV or XML formats. QBXcell can be used either interactively or as a scheduled BOE job. Above – example simple query returns data in a tabular format prior to exporting. QBXcell automatically exports a query into a main table with a series of sub-tables based on the objects sub properties (Property Bags). Can use Select, query, path, CUID and search syntax. Extracts schedule, processing, Limits and security information (roles and rights). Can extract information from multiple clusters into the same database tables for comparison.